Barolo and Nebbiolo are often confused. One is a region and one is a grape. The ‘King of Italian Wines’ is Barolo wine, a light-coloured yet full-bodied red wine from the Piedmont area of northern Italy. But, what does Barolo taste like? 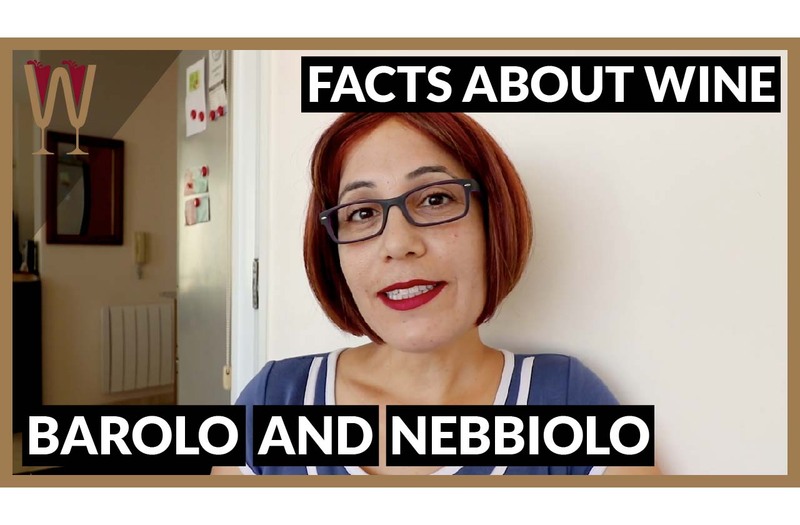 In this video WineScribble gives her top 5 facts about Barolo wines, including the taste of Barolo, the smell of Barolo and information about the grape Nebbiolo that is native to the Barolo region. Hey tasters, I woke up this morning to this message. Having the best time ever in Barolo, almost wish you were here, but then I’d have to share the wine, Robyn. That’s my best friend, Robyn, and she has gone on holiday in Barolo. I am so jealous. So, obviously Barolo is on my mind this week, and I thought I could share with you some quick facts about Barolo. Including, what does Barolo taste like? Wine Fact Number One: What is Barolo? Barolo is not the name of a grape variety. Instead, Barolo is the name of a region in Italy where this powerful red wine is made. The grape used to make Barolo wine is called Nebbiolo. Nebbiolo is also used to make wine in a neighbouring region called Barbaresco. So, Barolo wine and Barbaresco wine are made using the exact same grape. Barolo Wine Fact Number Two: What does Nebbiolo mean? There are two possible explanations for the name Nebbiolo. Nebbiolo may be derived from the word Nebbia which is Italian for fog. This word refers to the thick fog that covers the region. Another explanation may be that La Nebbia refers to the thin white layer that covers Nebbiolo grapes when they mature, which also resembles fog. Almost a hundred percent of Nebbiolo grapes grow in Piedmont in Italy. Nobody has managed to get this grape to flourish anywhere else in the world. Many have tried in the USA, Mexico, and Australia but Piedmont the native birthplace of Nebbiolo grapes has a unique terroir: a continental climate moderated by the Tanaro river that runs through it. Nebbiolo simply doesn’t want to live anywhere else. Wine Fact Number Four: What does Barolo taste like? What does Barolo taste like? In a word intense! High in tannins, high in acidity, moderate to high alcohol levels, full-bodied wine. It is a powerful wine that should be enjoyed with food. And, it’s moderately fruity, black cherries blackberries some red cherries, cranberries. Also, more earthy aromas include leather, tar, cedar, tobacco. And, a little bit of spice! Some pepper and some anise. Finally, floral aromas? Deep rose and rose hip. Barolo is classified as DOCG, the highest classification an Italian wine can enjoy. This means it has to be made to a very specific requirement. Regular Barolo spends one year in oak and is aged for a total of three years. Riserva Barolo however, spends up to 18 months in oak and a total aging of 57 months! All this time this wine spends in oak is responsible for the wonderful characteristic aromas of tobacco and smoke and vanilla that we all love about Barolo. Comment below and let me know whether you enjoyed these five facts about Barolo. Have you subscribed yet? Hmm, yeah you should definitely subscribe. I’ll see you on the next video. Tasting guide: What does Barolo taste like?